Begin by making sure your oven rack is in the middle of your oven, then preheat to 180 degrees Celsius (approximately 350 degrees Fahrenheit). Lightly coat the inside of two springform pans in unsalted butter and line them with parchment paper. My pans are around 20 centimetres in diameter, so vary cook time accordingly if you’re using something different. 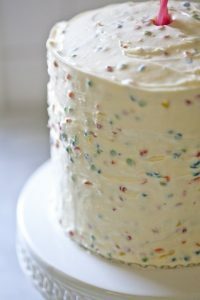 Since this is a fairly basic cake recipe, looking up any vanilla cake recipe that uses pans similar to yours in size should provide you with a good base number regardless of whether the ingredient list is the same or not. In a large bowl, evenly mix the flour, baking powder, and salt. Put this aside for later. Either in an electric standing mixer or with a handheld mixer in a large bowl, beat together the eggs, vanilla, and sugar until the mixture becomes thick and pale. This should take about 10 minutes. Try and drizzle the canola oil in slowly as you do this. Switching the mixer to a low speed—so as not to make a mess—gently alternate between adding the dry ingredients and the milk until everything is incorporated. The batter should be smooth. When you’ve achieved this texture, add in the cinnamon hearts. Distribute the batter between the two pans but be careful not to fill them all the way to the very top. Then bake for 50 to 55 minutes before checking them. To know if the centre is done, stick a toothpick in it. If it comes out clean, it’s ready—if not, put the cake back in for another 15 minutes. Continue cooking until both cakes are done. Once baked, allow the cakes to cool completely before leveling the cakes. Once done, spread frosting in the centre and stack the two cakes, then frost the entire outside.